I have jokingly said that “trust no one and question everything” should be the mantra for Pretty Little Liars. On the show, no one is who they seem and everyone lies to everyone else with relative ease. This same mantra can also be applied to ABC’s newest hit show, Quantico. In its second episode, “America,” the show did something different from Pretty Little Liars, though. It didn’t just ask us to question everyone –– we already know that all of the recruits are harboring secrets. The show asked us to question the sincerity of their answers to the question: “Why do you want to join the FBI?” The episode opens with each recruit answering and ends with Miranda essentially telling the recruits and the audience that everyone is a liar. ... Okay, so maybe it is really similar to Pretty Little Liars in that regard after all. 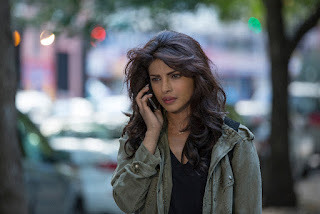 Which really brings us to an interesting predicament, here: if we’re to believe everyone is harboring a secret and everyone is lying about something, Alex Parrish becomes a really interesting character (more interesting than she was initially, and she was interesting initially). We’ve seen over the course of the past two episodes that every recruit is capable of evil –– that they have a secret they would do a lot to protect. So where does that leave Alex? She’s seemingly being presented as “the innocent”: she’s the smartest and she’s got a pretty pure heart (in spite of some minor crimes and misdeeds she does during this episode). But... should we trust her? Should we believe her, given what we know of everyone else in the FBI? If someone is framing her, the question is: why? Why, when Alex seems to be this model citizen whose secret occurred in her youth and does not seem like one that might cause her to become a terrorist? If Alex is indeed an innocent, why would someone be framing HER? Would it be to protect their own secret or simply because they are malicious? In novels, I love the ideas of unreliable narrators. But it’s also kind of frustrating. When I was in my AP Literature class in high school, I had to read a book called The Things They Carried –– a story of war and soldiers in which truth and reality fluctuate. We don’t know if we can trust the person who is telling us the story, and therefore we don’t know if we can trust the story. So if you don’t trust your source, you can’t (and shouldn’t) trust the information that comes from them. There is a lot of dichotomy between truth and lies present in “America,” and a lot of information, too. I’m going to try to unpack it based on characters this week. Let’s see how we do! Present-day Alex is on the run, but much more clever than any of the FBI agents –– most notably Liam –– give her credit for. Miranda tells Liam that the Academy trained her too well; they’ve essentially created the perfect fugitive/agent. Here’s also what we learn in the present-day: Liam is (or was) in love with Alex and scorned. What I love about the way Quantico is navigating the flashback and present-day narratives is that they’ll drop little things like this in the scenes or lines of dialogue, just to make sure the audience is aware that a shift happened in the past that we will see eventually, and we should look out for it. That particular revelation makes scenes with Liam and Alex in the past even more important to us. It’s like a little clue or a treasure map without being too on-the-nose, and I’m appreciative of the subtle way the show is building the story of these recruits. We’re getting to know them and trust them (or distrust them) slowly. Alex manages to out-smart the FBI by slipping the walkie-talkie she used whilst on the run into some poor, unsuspecting dude’s delivery bag. As an aside: the FBI is really bad at their job in this show which I think is the only thing bugging me so far (unless that is supposed to be on purpose). Like, they had no idea about Eric’s really, really sordid past and were out-smarted by an agent who is still really new. Get it together, FBI. While Alex is out-smarting the supposedly really smart people on this show, she’s also trying to figure out what exactly happened the morning of the bombing and why Booth was at her apartment in the first place. So she does what one would normally do and locates a restaurant with cameras facing her building to watch who enters and exits and when. She’s able to determine that there is a secret entryway from her apartment bathroom into the vacant apartment next-door… where a TON of bomb-making supplies are being held. It’s not looking good for Alex who then nearly gets caught by Nathalie (until Alex, in a brilliant fight sequence, manages to handcuff Nathalie to a pole on the roof –– Nathalie emits frustration that is akin to what you might say or do if your friend beat you at Monopoly). But before Alex flees, she manages to swipe a piece of evidence from the floor of the apartment next to hers (without wearing any gloves or wrapping the evidence in any way –– DID YOU NOT WATCH CSI, ALEX?). Next, she calls Booth and he tells her that he’s sorry for what happened at Quantico (we don’t know what happened but I’m sure you DO have reason to apologize, Booth) and that he just went to her apartment in order to talk to her since they haven’t spoken in a long time. Booth knows that Alex didn’t shoot him but he can’t let Liam know that he knows that. The only logical solution? He has to tell Liam that Alex shot him. Alex is okay with this, for… some reason? The episode ends with her embarking on a journey to find out who really planted the bomb in New York and who is trying to frame her. She tells Booth that it was someone in the recruits. And she's going to find out WHO. Lingering storyline questions: Does Alex know that Booth was in on some plan with Liam? Is Liam the one who shot Booth? Maybe because Booth fell in love with Alex and Liam wasn’t down with that? (For two-fold reasons: because it screwed up their plan and because HE was in love with her.) Does Alex have an idea of which recruit it might be? Did someone ever let that poor woman out of the locked room in the restaurant? How does Alex have her hair and makeup look so flawless while on the run? So as it turns out, maybe people at the FBI are a little bit smarter than I give them credit for. Or maybe they were just smarter nine months ago, because Liam totally figures out that Nimah is a twin and Miranda figures out that Booth is an undercover agent. Unfortunately for Miranda, she doesn’t figure that Liam is the one who hired Booth as an agent. So close and yet so far. Apparently Miranda is using Quantico as a way to prime Nimah and Raina for an assignment after their training. It’s a really important mission and the first of its kind (we’re not told much more than that), so the twins need to not blow their covers in order for it to be successful. For them, that necessitates that they act more alike than they have been. If one twin can only do ten push-ups, the other can’t be showing off. If one twin is becoming BFFs with Simon (Raina likes Simon, Nimah does not) then both of them need to. Essentially, they need to not raise any suspicions and they’re toeing a dangerous line, currently, in getting themselves caught. Lingering storyline questions: What is the assignment Nimah and Raina are needed for? Who will be the first recruit to figure out that they’re twinning? SIMON, SHELBY, AND CALEB –– OH MY! Meanwhile, Shelby continues to have a love-hate relationship with Caleb, her sorta-crush from the pilot who, you know, was horrible and essentially made someone kill themselves. Caleb returns to his horrible self this episode, frustrating Shelby by reminding her that he’s not really that guy she had the conversation with at the pool and is –– instead –– just a terrible person. But Caleb proves a little bit of humanity toward the end of the episode by telling Shelby that he had no choice in becoming an analyst: it was either that job or nothing. Shelby feels a moment of compassion for him but then smartly exits his room. And then Caleb, at the end of the episode, reveals to the audience that he has a fake social media account under a different name. Or, perhaps, his real name? WHO KNOWS. Shelby spends most of the episode being extremely delightful, per usual, with a few moments of eyebrow-raising actions (she deletes an Arabic contact from her phone after her FBI interview, but then at the episode’s end, answers the phone and says –– in Arabic –– "I told you not to call for a while"). Overall though, she’s pretty adorable and definitely the bright ray of (possibly evil, because everyone is a suspect) sunshine. Lingering storyline questions: Does Caleb have a secret identity or does he really just like little huskies? (I mean, who wouldn’t?) That picture of The Catcher in the Rye seemed pretty suspicious. What connection does Shelby have to someone who speaks Arabic? How did Simon get in and out of Gaza and what was he really doing there? Both of these new recruits are sketchy. 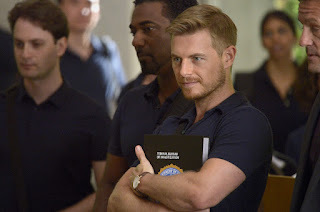 Rick Cosnett did a wonderful job balancing the really silly, eager sides of Elias (he seriously seemed like such a smiley puppy for most of the episode) with the slightly shady, extremely inquisitive ones. Elias has figured out that Simon’s glasses are fake and he’s taken a close interest in the recruit. Initially, we’re meant to assume it’s just a romantic interest. But throughout the rest of the episode and especially toward the end, there are hints that Elias might be interested in Simon for other reasons. Nathalie is exactly the kind of archetypal “competitive mean girl” one might expect from a show like Quantico: she thinks she knows everything better than Alex does, tries to get Booth to focus on her and not Alex, and generally has an air of self-righteousness that I find irritating. I could do without more of Nathalie, even though I’m sure she’ll play a more prominent role in the series’ flashbacks. Lingering storyline questions: Will Elias figure out what Simon is up to? And is he genuinely interested in him or sent by someone else to investigate? Can Rick Cosnett be any more gorgeous? What is Nathalie’s relationship with Booth? Why does she want to follow Alex around and beat her at everything? Why is she faking a scar? Everyone has a secret at Quantico and everyone is lying. The trick is, who is lying about the most important thing? Whose secret most lends them to being a terrorist? I’m not sure that after two episodes, the series is giving us any definitive answers. But I’m really pleased by how the show is setting up the stories of these characters and how engaged I find myself with all of them (even the ones I don’t care about as much). With Alex on the run, hopefully she finds some answers along her way and is able to distinguish friends from enemies. MOST LIKELY SUSPECT THIS WEEK: Liam has shady written all over him, so he’s definitely up to something in the flashbacks and in the present. Is it the cool thing these days to have all of the lead characters in shows do voiceover introductions? Because that totally happened this episode. "What are you gonna do?" "I'm gonna find the needle." I love Caleb, but also I hate him. This show is immensely captivating. I hope it continues to be that way.